People new to the realms of web design often hear the word “markup” and wonder what it means and how it is different from the more commonly known term “code.” Predominantly, a markup language is designed to process, define and present text; tag embedding and text annotations are carried out within styled files to make text manipulation easy for the computer. Historically, the phrase markup language takes inspiration from the process of manuscript marking-up via which printer instructions were derived from handwritten markups. HTML is the most commonly used markup language. A few years ago an update for this language titled HTML5 was released. 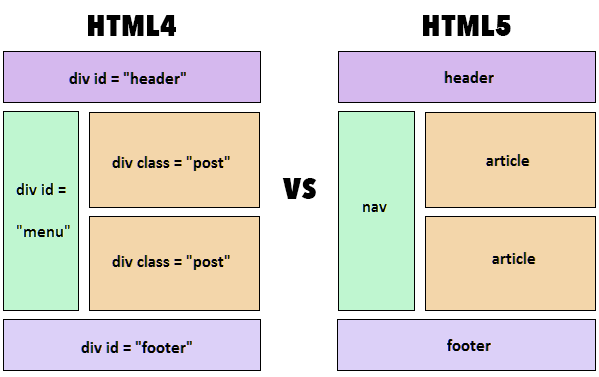 In this tutorial, we will overview the difference between HTML and HTML5. HTML or Hyper-Text Markup Language can be referred to as the Worldwide Web’s primary language. Most of the web pages hosted on the internet are written in some variation of HTML. Via HTML, developers ensure exactly how multimedia, text, and hyperlink among other things get displayed in web browsers. From the elements that establish connections with your document (hypertext) to the ones that make these documents interactive (e.g. forms); all are constituents of HTML. 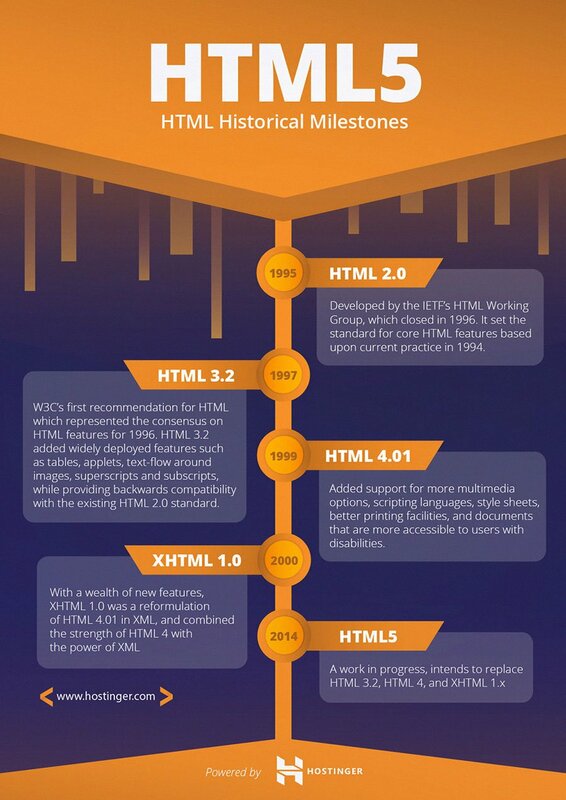 The HTML standard was developed by W3C or the World Wide Web Consortium in 1997. In HTML, tags are used to define text structures; tags, and elements are defined using the < and > characters. Some of the examples for the previously mentioned tags are headings, tables, and paragraphs, etc. Browsers are responsible for rendering of the web page content via these tags. Since long, HTML has not been the only web development standard. In the early days, all the content and style tags were present in one giant, cumbersome (and often complicated) language. Over time, W3C came to the decision that segregation between the content and style of a web page was necessary; this led to the creation of style sheets. These days, tags that are used for defining the style of a document (e.g. FONT) have almost gotten deprecated as people have started preferring style sheets and only the content defining tags (e.g. H1) still form the core HTML. HTML has seen many updates over time, and currently, the newest HTML version is HTML5. HTML5 is of course still primarily a markup language, but it has added a plethora of features to the original HTML and has eradicated some of the strictness that was present in XHTML. Every day, new features get added to HTML5, but there aren’t any new numbered releases rolled out there. 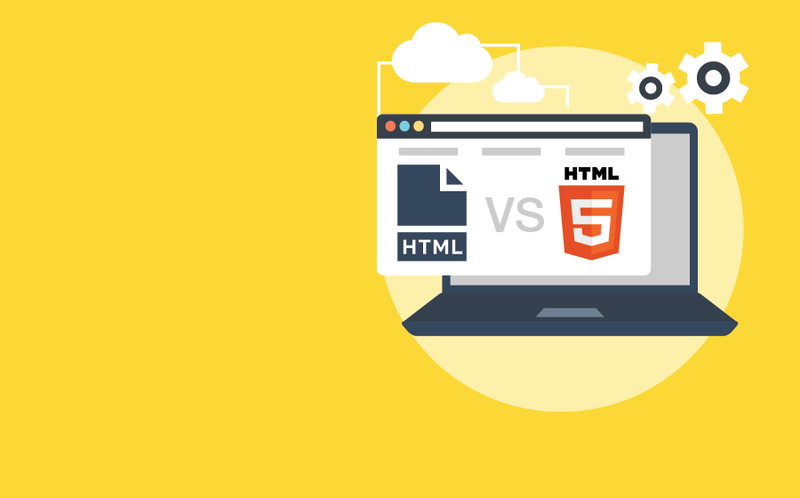 The main difference between HTML and HTML5 can be that neither audio nor video is a constituent of HTML whereas both can be considered integral parts of HTML5. SVG, canvas and other virtual vector graphics are supported in HTML5, whereas in HTML, using vector graphics was only possible by using it in conjunction with different technologies like Flash, VML, and Silver-light, etc. HTML5 uses web SQL databases, application cache for temporary storing data, meanwhile, in HTML, only browser cache could be utilized for this purpose. HTML5 is not based on SGML, and that allows it to have improved parsing rules which provide enhanced compatibility. In HTML5, inline MathML and SVG can be used in text whereas this wasn’t possible in HTML. Some of the deprecated elements that have now been dropped completely are: isindex, noframes, acronym, applet, basefont, dir, font, frame, frameset, big, center, strike, tt. HTML5 supports new kinds of form controls, for example: dates and times, email, number, range, tel, url, search etc. There are many new elements introduced in HTML. Some of the most important ones are: summary, time, aside, audio, command, data, datalist, details, embed, wbr, figcaption, figure, footer, header, article, hgroup, bdi, canvas, keygen, mark, meter, nav, output, progress, rp, rt, ruby, section, source, track, video. Most of the browsers have the support to parse structurally/syntactically incorrect HTML code, but until a few years ago, there was no standardized process to handle this. It meant that new browser developers had to perform malformed HTML document tests in different browsers in the bid to create improved error handling processes via the marvels of reverse engineering. The consistent HTML5 error handling has made a huge difference in this regard.The improved parsing algorithms that are used in HTML5 have unquantifiable benefits. Surveys reveal that around 90 percent of websites are liable to comprise of some incorrectly written code (tag soup) so being able to handle errors aptly is imperative. Furthermore, inherent error handling saves developers a lot of money and tons of time. To enhance code insinuation, improvements have been made to the semantic roles of various existing elements. Section, article, nav and header are the new elements that have replaced most of the now-obsolete div elements, and this has made the process of mistake-scanning a whole lot less complicated. One of the primary goals of HTML5 was to allow browsers to function as application platforms. Web sites in the past used to be a lot less complex but over time, the cumbersomeness has increased. HTML5 provides developers with enhanced control of their websites’ performance. In the past, the developers had to use workarounds because many server-side technologies and browser extensions were not present. Now, with HTML5, there is no use to employ any JS-based or Flash work-around (as previously done in HTML4) because there are elements inherently present in HTML5 that provide all the functionalities. Even today, creating a mobile version of a website can be a headache for developers. The smartphone-owning demographic has seen exponential proliferation over the past decade, and that created a need for improved HTML standards. End users want to be able to access a web resource at any time and via any device which makes having responsive websites a requirement. HTML5 has made mobile support a lot simpler by being able to cater to the low-powered electronic devices like tablets and smartphones. It was possible to add custom attributes before HTML5, but it was a risky affair; for example, in HTML4, custom attributes would sometimes stop a page from rendering completely, and they could often become the cause of incorrect/invalid documents. The data-* attribute in HTML5 has brought an end to this often-occurring problem. There are multiple uses for this attribute, but the primary objective of its introduction was the storage of extra information about different elements. Now, custom data can be included, and it gives developers increased chances of making engaging and efficient web pages without having to introduce server-side lookups or Ajax calls. Cheat sheets can be a great help if you are starting to learn new language. Use the below HTML5 style sheet to get started with HTML5. This cheat sheet has all most commonly used HTML (HTML5 included) tags. Mobile browsers now crash a lot less frequently than the native application. This wasn’t the case before, when there wasn’t enough mobile web development support provided by HTML. The reliance on mobile websites is very high as almost 30 percent of mobile users detest downloading applications. So now if a user wants to use company’s services but doesn’t want to download their application, they can just log on to the company’s responsive website to do so. The ability to support native audio and video elements means that the users won’t have to download additional plugins to view multimedia on your website. This rich media support provided by HTML5 is one of the biggest reasons why it’s used a lot more frequently than HTML in the world of today. A newer version of any language can hardly not be better than its predecessor and HTML5 is certainly not an exception to the fact. With every passing year, developers will unravel new ways to benefit from HTML5. Furthermore, social media is expected to change even further with the language shortly. Where the wave of change has already hit many developers over the world, it’s still expected that HTML5 adoption will increase even more rapidly in the years to come. To maximize the potential of modern day browsers, it’s of paramount importance to adopt HTML5 as quickly as possible. Thanks for the refreshing content! I liked this summary. Keep on going..! Thank you, very nicely explained. Thanks for helping with my holiday homework!